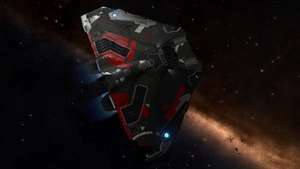 Free skin for the Cobra in Elite Dangerous - 10,000 to claim from PC Gamer. Why what is that handsome ship? The dark angles, the handsome blood-red highlights, it's the perfect look for deep-space tycoons and pirates alike. You could be the proud owner of this exclusive PC Gamer ship skin for the Cobra, if you enter today's competition. The giveaway is celebrating Elite Dangerous' ongoing Horizons expansion, which will add new features throughout the year, and already lets players land on planets so they can shoot space barnacles. To enter, simply follow the instructions in the widget below. We've got 10,000 keys to give away; first come, first served. If you get a code, you can redeem it at FrontierStore.net. If you're already playing Elite Dangerous you'll have an account; if not, you'll need to set one up. Login, click 'My Account' then 'Product Access Key' and input your code. You will find the PC Gamer Paint Job on your 'My Downloadable Products' page here. Just got Star Citizen today- much more my cup of tea when compared with Elite. I got out of my space craft tonight, flew along into a com array to fix it then went back to my space craft. If you buy before the 31 st you get two games for the price of one. Give it a try. Just got Star Citizen today- much more my cup of tea when compared with … Just got Star Citizen today- much more my cup of tea when compared with Elite. I got out of my space craft tonight, flew along into a com array to fix it then went back to my space craft. If you buy before the 31 st you get two games for the price of one. Give it a try. ​ you got a link to it?